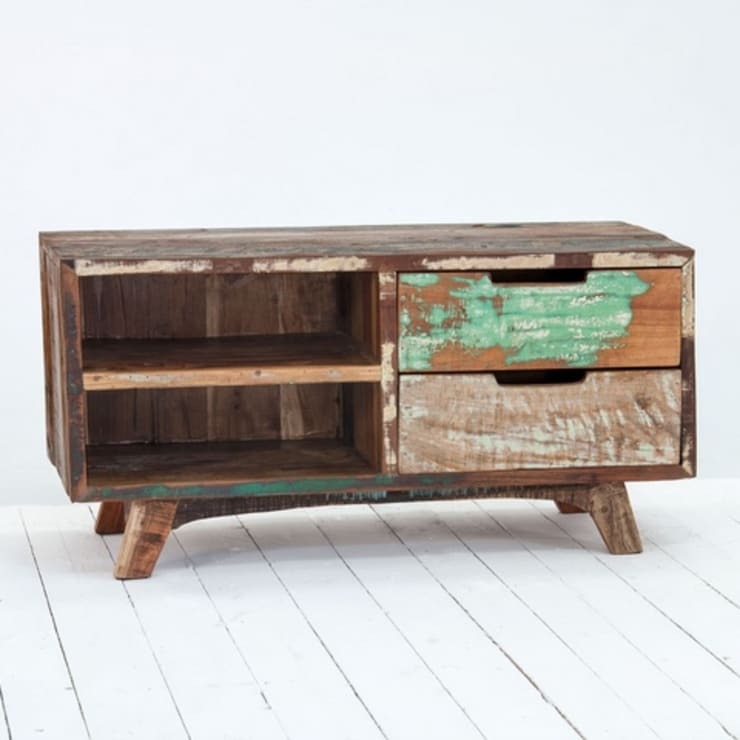 8 wooden TV shelves we want for our home! Television units have been indispensable technology products in our homes. Watching TV is inevitably part of our lives! With the aggressive entry of smartphones and progress of computers, televisions too, continue to evolve and thus, survive to be still part of one’s daily activities. 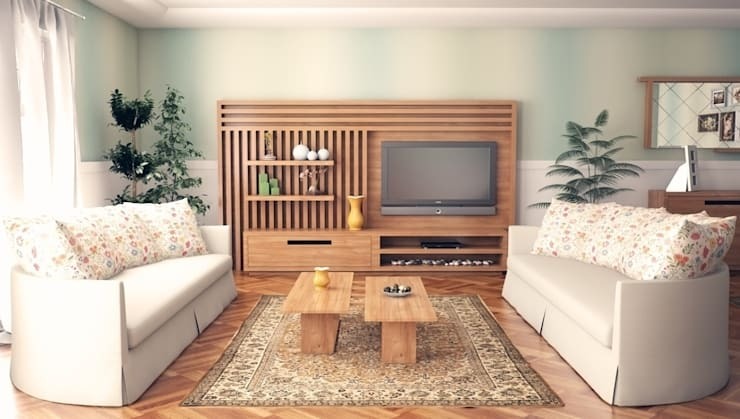 Even with our living room arrangement, we often start by locating the telly first in decorating the hall – this major piece of furniture becomes the centerpiece in our homes. In today's compilation, we have included models of the most stylish television unit that does not only focus on functionality, but also on design. Moreover, if some of these models have really caught your eyes, you can make the same carpets or customize one to suit your personal home. Whether you like minimalistic styles or rustic, you'll find a model that will definitely appeal to you in this article. Our first example is a compact model. This rectangular-shaped unit, designed with horizontal and vertical gutters for a modern look, provides room for air and forms a full backdrop behind the television. This model, which comes in a wide range of drawers and raffles, is a stylish model in its simplicity that can accommodate many decoration styles. 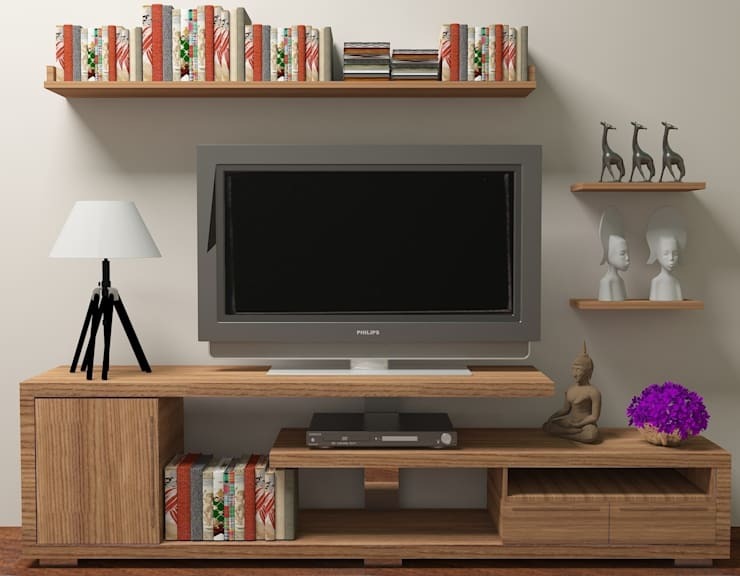 Design your living room according to seasons and occasions with this versatile TV shelf while staying efficient with your things! The television unit you see in the picture is a four-piece set with a very simple and compact design. In addition to television and electronic devices, there are three shelves in the unit that you can place your other belongings like books and other display independently. This beautiful design is a grab for those with smaller TV rooms. 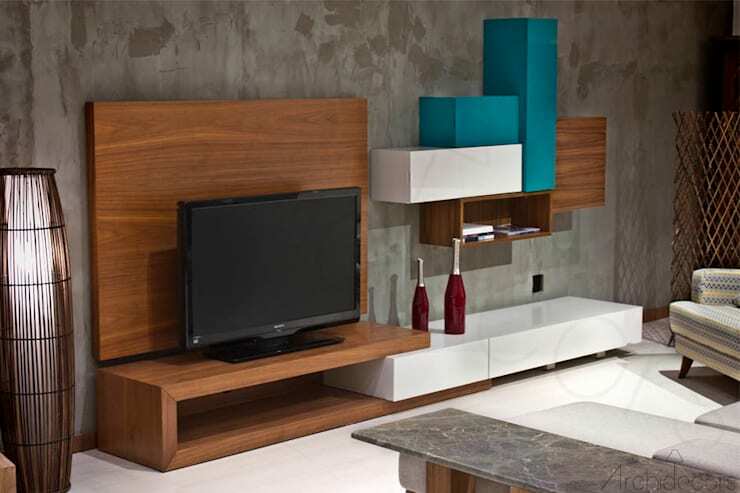 In the television unit we saw in the photo, the natural brown texture, white and blue colors were used together. Recreate and style the living room having your own color spectrum of your furniture; you can use, mix and match natural surfaces and colored surfaces together. This television unit, integrated with a library, has ample storage space for your books, newspapers, magazines, decorative accessories and many more. With this unit that has more depth than the other models, you can guarantee that your living room won’t look cluttered, and that all your goods are in proper place. This is not just modish but also advantageous for big families who have a lot of stuff! Extra tip: This is also advisable for the ‘collector’ kinds of people such as: toy collectors, CD collectors, travel mug collectors and book lovers, for those who’d want to display their memorabilia. 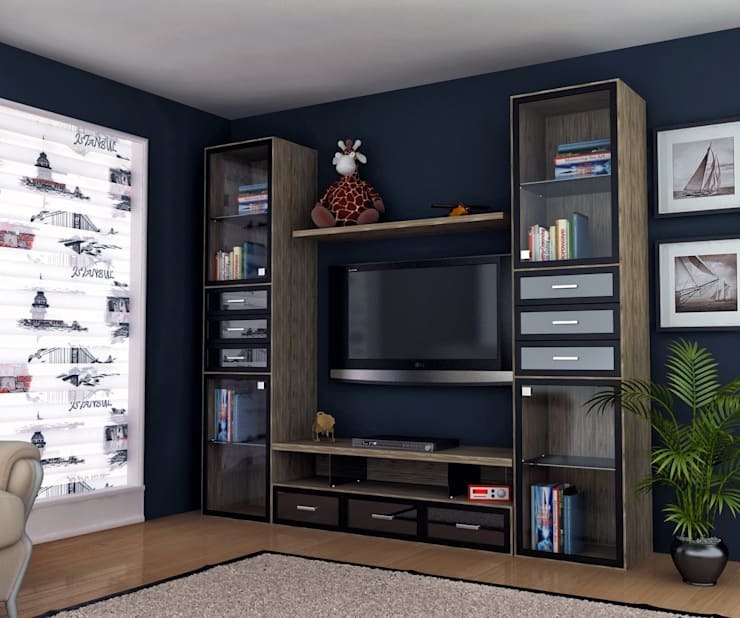 In this example, the TV area is integrated into a storage and display unit that covers the entire wall from top to bottom and from side to side. This is a smart-and-chic solution especially for large living rooms. This is for those who want lesser furniture but fuller look, with minimalistic style on the side. For a total minimalist home, you have to see this one! This model, which consists of transformed parts, replicates the mid-century style in a magnificent way. You can even build it yourself, while you’re in the mood for some handiwork and around some sculptural atmosphere. Having a rustic-styled home or using rustic or rural decorations around the whole house wouldn’t mean abandoning the joy of having and watching television, just because it doesn’t quite fit the mood. It does not seem possible in today's conditions. 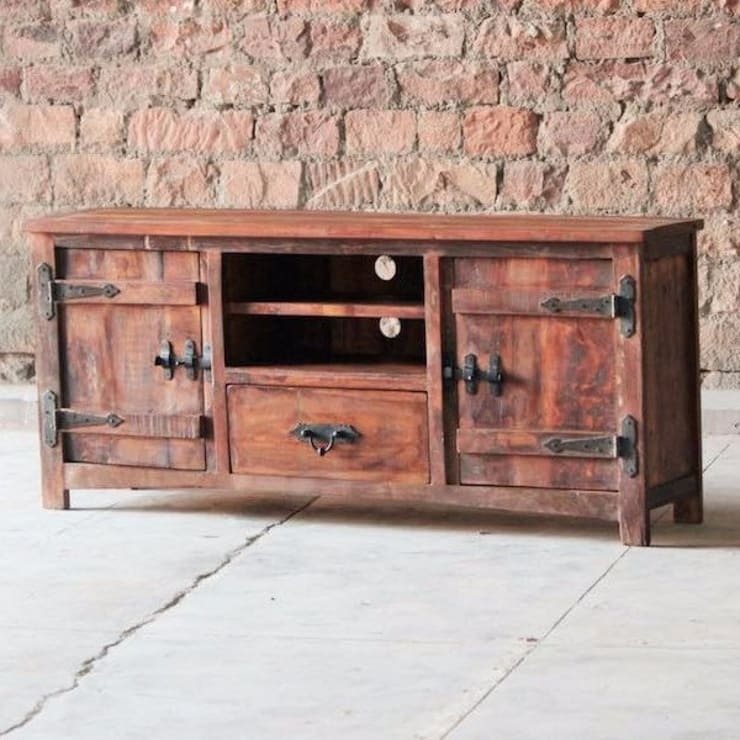 So how about an eye-catching wooden TV shelf with huge metal hinges to go with that telly? This is for the quirky ones. What about open and closed rack systems that you can use like a jigsaw, in addition to a floor unit of your desired length which you can mount as you like? All you need to notice is that the floor unit and the wall units are mounted in the same line forming design and illusion. If you’re in for more awesome and out of the box designs for your entertainment room, see these 10 small but stylish living rooms!